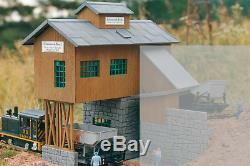 62009 Gravel Works Main Building, Building Kit (G-Scale). Accessories are made primarily of an extremely tough, UV- and weather-resistant polycarbonate plastic material, with ultra fade-resistant color molded in. Many parts are also lightly weathered for a more realistic look. Most kits include a tube of plastic glue, for buildings that will be used indoors. For outdoor use, we highly recommend using PIKO #55701 PIKO-Fix plastic cement to truly fuse the parts together. Works well with the 69010 Side Building and 69011 Automatic Loader. The item "PIKO 62009, G Scale / One Gauge, Gravel Works Main Building, Building Kit" is in sale since Saturday, March 24, 2018. This item is in the category "Toys & Hobbies\Model Railroads & Trains\G Scale\Parts & Accessories\Buildings, Tunnels & Bridges".